The Environmental Investigations Agency (EIA) found widespread use of CFC-11 in China, even though the chemical was fully banned back in 2010. Scientists have been extremely puzzled by the mysterious rise in emissions. But this report suggests the key source is China’s home construction industry. Just two months ago, researchers published a study showing that the expected decline in the use of CFC-11 after it was completely banned eight years ago had slowed to a crawl. Rumours were rife as to the source. There was a concern among some experts that the chemical was being used to secretly enrich uranium for use in nuclear weapons. The reality it seems is more about insulation than proliferation. Remind me how the hole in ozone layer came about? Scientists discovered in 1985, much to their surprise, that there was a 30% drop in ozone levels over Antarctica in October of that year. By 1992, the hole was as large as North America. What was happening was that chemicals called chlorofluorocarbons contained in refrigeration, air conditioning, packaging, insulation, solvents, and aerosol propellants were releasing chlorine or bromine molecules when they were exposed to intense UV light in the stratosphere. When chlorine and bromine atoms come into contact with ozone, they destroy the molecules. One chlorine atom can destroy over 100,000 ozone molecules before it is removed from the stratosphere. Ozone can be destroyed more quickly than it is naturally created. So what did the world do about this? For once, the world acted speedily and to good effect. Most nations, including the chemical industry, signed up to the Montreal Protocol which quickly banned most of the worst-offending chemicals. Developing countries were given much longer to replace the gases. So while most of the richer countries got rid of CFC-11 in the mid-1990s, China and others were expected to completely get rid of it in 2010. That obviously hasn’t happened just yet. I thought the ozone hole was recovering? 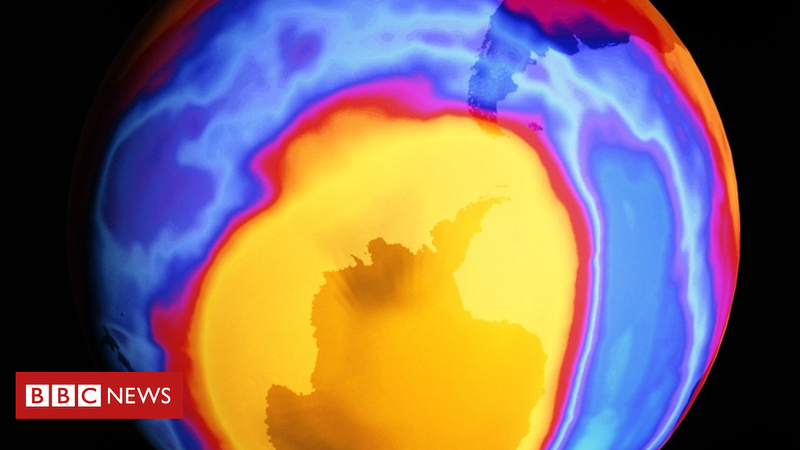 Back in 2014 researchers reported the first signs of a thickening in the ozone layer. At that point they said it would take a decade for the hole to start to shrink but by September 2015 scientists found that the hole was approximately 4 million sq km smaller than it was in the year 2000 – that’s an area the size of India. All this was due to the global phase out of CFCs. So it was a major surprise to ozone experts to find that the expected decline in these elements in the air had stalled. And now, according to the EIA, the reason behind the slowdown has been discovered – and it’s mainly down to Chinese builders!